Ever notice how South African political debate focuses on points-scoring or name-calling, with hardly anyone mentioning the people who foot the bill for corruption and excess? People like you and me who pay for politicians' salaries, cars, first-class travel and other assorted luxuries? Well, the Taxpayers' Movement is aiming to change that. If you’re “gatvol” of corruption, fancy cars and other extravagances paid for out of your pocket, or the fact that you’re being double-punched by a government that wants road tax and then taxes you at tollgates, you can stop whingeing at dinner parties and actually do something about it. 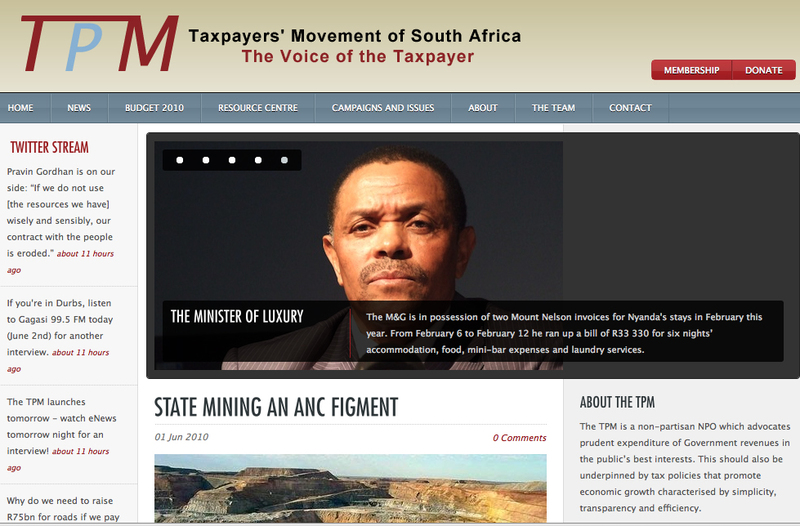 “The Taxpayers’ Movement of South Africa is a non-partisan, non-profit organisation that advocates the prudent expenditure of government revenues in the public’s best interests,” says award-winning independent journalist Maya Fisher-French, who is a founding crusader behind the TPM. Other founders include Jonathan Friedland (former associate lecturer at Wits and currently in the banking division at one of the big-four accounting firms), Leon Louw (executive director of the Free Market Foundation) and Gillian Findlay (economist and founder of Cambial Communications). Communications minister Siphiwe Nyanda – otherwise known as “The Minister of Luxury” – recently mooted a bill to propose a 1% personal levy on the income tax of hard-working South Africans so that this could be used to finance the “efficient” and “well-run” propaganda house, the SABC. Nyanda, former head of South Africa’s defence force, is the same minister whose unofficial residences include the Mount Nelson Hotel and the Twelve Apostles in Cape Town. “What concerns us is that many government departments are run as if the money that is being used is ‘own money’. There is no accountability. Yes, there are sectors of government such as Pravin Gordhan’s ministry (finance) that is fighting corruption and this must be supported, but other ministers need to be made what aware that their appetite for luxury is costing hard-working taxpayers,” says Fisher-French. She adds that when a minister spends R4,000 a night on a hotel room and one extrapolates that to a year it means that one middle-class taxpayer has to work eight years to pay off the hotel bill. Similarly, a R1 million luxury car would take the same taxpayer 16 years to pay off. “The first campaign TPM is going to tackle is the two-parliament debate. We support cutting down to just one parliament because this has led to a lot of corruption,” says Fisher-French. “This largely contributed to the Travelgate issue, and when the car scandals broke, we saw that ministers had bought not one but two luxury cars because of Parliament being split between Cape Town and Johannesburg. We want to lobby for the streamlining of Parliament to try to stamp out that corruption and the huge cost of running parliament,” she says. This initiative already has support from economists Mike Schussler of economists.co.za and Dawie Roodt of the Efficient Group, who say it is about time taxpayers got some muscle. The TPM will educate, offer information, do research, lobby government for better governance and weed out systemic problems that affect taxpayers. Fisher-French says the TPM will lobby government in a constructive fashion in the hope of bringing about change and benefiting taxpayers who are already under significant pressure. The Taxpayers’ Movement is an idea whose time has come and will hopefully mature into a powerful voice to represent aggrieved ordinary taxpayers who rightfully demand real service delivery and the abolition of waste rather than a government populated by ministries of wealth and leisure.